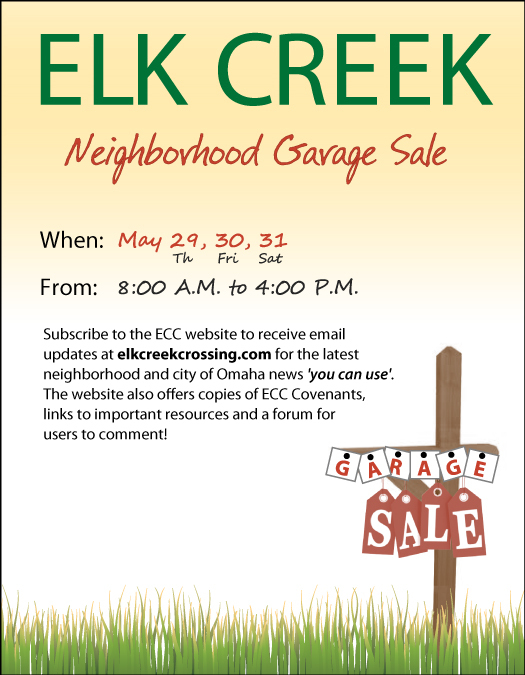 (Omaha, NE) — The 2014 Elk Creek Crossing Annual garage sales event dates are set. Mark your calendar for Thursday-Saturday, May 29-31st. Our event shall run during the same dates as adjacent neighborhood Walnut Ridge. The ECC HOA shall purchase signage, run advertisements in the Omaha World Herald and tout the garage sales on Craig’s List. We encourage homeowners to buy signs, too. Kudos to new ECC HOA board secretary Ann Smith for this ad. Previous ECC HOA Easter Egg Hunt A Blast! Next Neighborhood Garage Sales Th-Sat!